Stephen Strasburg is at least as good against the Pirates as Russ Ortiz. Stephen Strasburg's curveball breaks across five dimensions. A Stephen Strasburg fastball can exit a human skull at the speed of sound. Stephen Strasburg's slider went back in time, shattered Governor Connally's right wrist, then turned left twice and exploded the President's head. After Strasburg recorded his 12th strikeout, Cubs advance scout Dave Littlefield called Nationals GM Mike Rizzo to say he was now open to the possibility of dealing Kip Wells in a straight up trade, and he had but one player in mind. Delwyn Young cares not for your $15 million guaranteed contract. Stephen Strasburg's changeup can travel at up to four different speeds simultaneously. 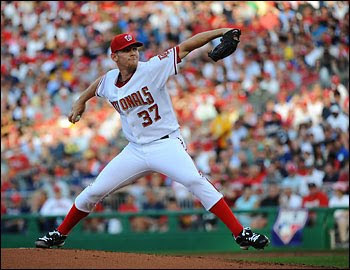 Later this season, Stephen Strasburg will trigger an obscure clause in his contract allowing him to become a free agent after pitching a perfect game in which he never throws the same pitch twice, instead creating new pitches for each delivery. The New York Times will break with its sports style guide and refer to Stephen Strasburg as "Mr. Stephen Strasburg" on every reference. After watching four innings of Strasburg's debut on tape, New York Mets third baseman David Wright called the commissioner's office to concede all of his future career at-batsagainst Strasburg as strikeouts as a means of expediting play. Jeff Karstens looks even more like a member of the British Royal family when he steps in to hit against Stephen Strasburg.